A very difficult time in college in all aspects pushed me towards following the reunion of a pop act that was one of my first exposures to music. I heavily followed this group for almost 7 years until the novelty wore off, but not without making friends along the way. For that time, I ignored my eclectic taste, and missed out on other experiences. So fast forward to present time, where I was older, and searching for my musical passion again. This year (2016) has been interesting, depressing, and invigorating all for different reasons. That old adage, "Everything happens for a reason." Well, finding my love for Markus Schulz, and Trance music again has been that this year. 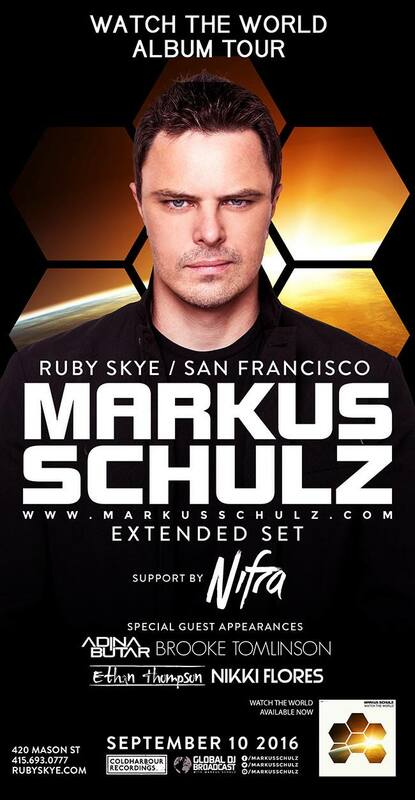 It just so happens that canceling a trip to LA last minute allowed me to attend my first Markus Schulz set in 5 years at Maya Day and Nightclub in Scottsdale, Arizona as recapped on this blog in January. Little did I know, that this experience with a close friend was going to capture the love that began for this music close to 15 years ago. Knowing that Markus Schulz got his start as a DJ here in Arizona back then has allowed me to find pride in being from Arizona. Without sharing my life story as a kid, you must know that my life has been guided through love of music from a very young age. From exposure from my parents, to learning and playing Alto and Baritone Saxophone since I was in the 7th grade. As I have gotten older, my love for music continues to grow, and I have found passion in discovering artists that hone their craft by the same passion. The following events of an Open to Close at Avalon in Hollywood, 'Watch the World' release party at Exchange LA, Electric Daisy Carnival (EDC) week events and the festival, lead me to this recently passed 'Watch the World' party in San Francisco at Ruby Skye. The similarities in following artists comes from bonding with others who share the same passion, thus, I have made new friends. Thanks to the general, I found the #SchulzArmy, and re-joined the Trance Family. I could got into many details why this has been rewarding just as fellow human beings, but that is an entire different blog post. After a short flight to SFO in the evening went well, meeting up with friends, then getting to venue, we were geared for another great night. Nifra's opening set brought great vibes for the night, and it was evident that the crowd was full of #SchulzArmy, Trance Family SF, and Trance Family. Then, it was time for Markus Schulz to take us on another journey. Considering this is now the 7th time seeing him live this year, the set did not disappoint. My respect for Markus grows with each set I hear knowing that he has dedicated his life to what comes out of the speakers. The special guests of Adina Butar, Brooke Tomlinson, and Nikki Flores slayed their vocal performances to the delight of the crowd. It was a long time coming getting to meet Brooke and Mike EFEX following their appearances on my podcast Trending Topics with BB. If you ever have the chance to see Markus Schulz live, just DO IT! You won't regret the experience!